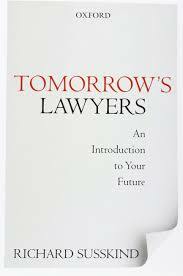 IN REVIEW: Richard Susskind, “Tomorrow’s Lawyers: An Introduction to Your Future”, Oxford University Press, 2013. You just want to slap him in the face, but for the fact that he is almost certainly right. The legal profession as we know it is in a slow and painful decline. There may be a very, very small space for traditional law and traditional lawyering in the future but “small” is the word to pay attention to here. Pressures to provide more legal services at less cost to the consumer, the continuing liberalization of the profession introducing new players into the legal services arena, and rapidly developing technologies, are all working together assiduously to ensure that the legal landscape as we know it will be virtually unrecognizable in decades to come. This is not such a bad thing, Susskind argues. If you dismantle what lawyers actually do (and charge a lot of money for) very little of it is a purely specialized service and most of it can be commoditized and multi-sourced. Susskind offers a variety of examples including in-sourcing, out-sourcing, off-shoring, de-lawyering (passing the work on to paralegals for example), relocating, sub-contracting, co-sourcing, near-shoring, leasing the engagement of lawyers, home sourcing, open sourcing (legal advice free of charge, usually on line), crowd-sourcing, solo-sourcing and computerizing. A final category is “no-sourcing”; this is where the legal service provider takes the view that the matter is not in need of legal sourcing at all. So where does that leave tomorrow’s lawyer? Where does that leave all of the new and emerging lawyers who are being trained right now to be traditional lawyers in circumstances where there is simply going to be less and less need for them? This is where Susskind urges everyone to get creative and to be involved in the fashioning of new legal services. Whilst he projects that tomorrow’s employers will likely be global accounting firms, major legal publishers, legal know-how providers, legal process outsourcers, High Street retail businesses, legal leasing agencies, new-look law firms, online legal service providers and legal management consultancies3, he also stresses that these are just predictions and we need to start thinking ourselves about new and novel ways to deliver legal services in cost effective ways. In order to prepare us to do this he calls for a re-vamping of legal education, including practical legal education, and invites lawyers to become multidisciplinary in their learning. Excited? Or just exhausted? I read this book in one sitting and whilst it was a little disheartening at times (in a goodbye yellow brick road kind of way) I could well see the sense in it. I imagine though, if I were a new or emerging lawyer just reaching the end of, or fresh out of a combined degree or my PLT training, this book might just reduce me to tears. Which is all the more reason why it’s a must read. As harsh as it might sound, there’s no power in being an ostrich with its head in the sand. This book is an appeal to mainly new lawyers to put the fiddle firmly down, take heart (because being a lawyer is still a truly wonderful thing) and make sure that while Rome burns, you are out there forging new distant lands, and doing it your way. 1 Richard Susskind, “Tomorrow’s Lawyers” An Introduction to Your Future”, (Oxford University Press, 2013) 164.